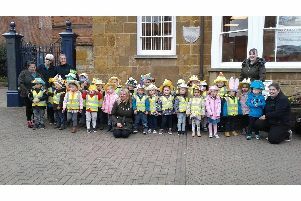 A pre-school group in the Harborough region which “required improvement” is back on track after a good report from Ofsted inspectors. It’s all smiles again at Ashby Parva Pre-school, which is north of Lutterworth. Ofsted inspectors reported that leadership was strong at the school, that children make good progress, and that the relationship between staff and children at the school was very good. “The parents are thrilled to bits” said the chair of the management committee at the pre-school, Jessica Lacey. “We had a new management team from January 4, and an Ofsted inspection on January 26, so the new team had only been in place two-and-a-bit weeks. Jessica said the pre-school had been completely refurbished, with new paint, new carpets and new equipment. There was a new pre-school manager, Wendy Jackson, with Claire Page as deputy manager. And Jessica said she was particularly pleased at the way old a nd new staff had “merged brilliantly”. The group was originally set up in 1972, and was called Ashby Parva and Bitteswell Playgroup. Parents can contact Ashby Parva Pre-School on 01455 697150, or 07521 386174.